Defeat the Hound and observe the Silvenar's marriage to the Green Lady. Silvenar — Defeat the Hound and free the city. The Handfast takes place between the Green Lady and the Silvenar, with Spinner Dothriel overseeing it. Indaenir, the new Silvenar, traveled across Malabal Tor to marry the Green Lady and fulfill his role as the spiritual leader of the Wood Elves. But the Hound arrived first, and is trying to usurp his position. Retrieve six silver shards from the Houndsmen. Defeat the Guardian of Silvenar. Talk to the Silvenar's projection. Talk to the Silvenar's Projection in the Great Tree. Free the three spinners by solving the puzzles or killing them. Talk to the Green Lady. The Silvenar suspects The Hound has turned the three spinners against him. You need to collect six silver shards, embodiments of stories, from the Houndsmen for the Silvenar to be sure. First, you talk to Scout Anglith southwest of the Silvenar. She tells you the Houndsmen are in the ravine. Once all six shards have been collected, you return to Scout Anglith. She says you need to defeat the Guardian of Silvenar, a spirit bound to the city's wards. If you defeat it, the wards will be temporarily severed. After you defeat the Guardian, a projection of the Silvenar appears. He senses the spinners are being held in the trees within the city. You need to learn about the spinners and their prisons to free them. You have to force the witches who bound them to tell you about the bindings and the locations of the spinners. The Houndsman Bewitchers are the ones you need to question. She is the youngest of the three. She acted like she knew she would be taken. She is in her home. 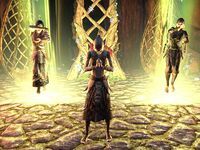 "Her essence focuses on the future of the Bosmer people as she sees it. Naturally, she believes in the love between the Green Lady and the Silvenar breaking through the shadow of the Hound." He is a fighter, but the Hound bound him in his own home. "The warrior-spinner focuses on the present. He sees a great battle with the Green Lady and the Hound to bring her to her true lord, the Silvenar. His bonds are tied to that sight." The Hound bound each of the spinners with their own strengths. Dothriel is the strongest of the three and possibly the oldest. She is also in her home. She predicts the Hound's death. "She lives in the past, patterns of ancient times replaying today." The Silvenar's projection appears inside the center tree after you question three Houndsman Bewitchers. If you fail to solve a puzzle, the spinner's spirit will appear. Killing the spirit will release the barrier, but it will also kill the spinner. He suggests looking around the homes for clues and reading the books. All the homes surround the Great Tree. You should return after you have broken their bonds. The clue for this puzzle is on a table to the right. The book is called The Time Is Past. Press the Ritual, the Apprentice, then the Mage. The clue to solving this puzzle is on a table to the left. Read the book called The Time Is Now. Press the Lady, the Warrior, then the Lord to free him. The clue to this puzzle is a scroll called The Time Will Come. It is on a table to the right. Press the Lover, the Shadow, then the Tower. Go back to the Silvenar. He can now enter the city, but the Hound has enthralled the Green Lady's spirit. You need to fight the Green Lady and the Hound in the audience hall. The Silvenar will pull the Green Lady to him and remove the Hound's minions. Once the Hound is finally defeated, talk to the Green Lady. She reveals the Hound was her good friend, Ulthorn. To complete the ceremony you need to find the Handfast. The spinners hid it somewhere in the city. Scout Anglith knows where the Handfast is. She runs up and places it on the green altar. The Silvenar and the Green Lady kneel next to the Handfast while Spinner Dothriel speaks. Talk to Spinner Dothriel after the ceremony ends to receive your reward. The Houndsmen, corrupted servants of the Hound, possess silver shards that may be the key to opening the city to the Silvenar. I need to collect some from the Houndsmen patroling the ravine beneath the town. I collected silver shards from the Houndsmen. Now I need to talk to Scout Anglith and find out what the Silvenar needs me to do next. I must take the silver shards into the city, but on the way, I have to defeat the Guardian of Silvenar, a huge creature protecting the outer bridge. Defeating it will give the Silvenar an opportunity to project his essence inside the barrier. I defeated the guardian, at least temporarily. The Silvenar can now project his essence into the city. I should talk to his Psijic projection while the interval lasts. The Silvenar believes the bonds holding the three Spinners can be unlocked, but only if I learn how they were bound. The only people who can tell me are the Houndsmen Bewitchers. I need to interrogate them. I interrogated some of the bewitchers and learned a little about the spinners. The Silvenar told me to meet him at the base of the Great Tree in the center of the city. Hopefully, he has more information. I need to get inside the spinners' homes and search for the clues to solving their prison-puzzles. The Silvenar said I can free them either by solving the puzzles, or killing the spinners, but he'd rather I do the former. The spinners' bonds are broken. I can return to the Silvenar and find out what he needs me to do next. He should be at the base of the Great Tree. The Silvenar is using the silver shards charged with the spinners' energy to break down the barrier, but he needs me to get inside the Silvenar's Audience Hall and challenge the Hound. I must defeat the Hound in battle if I'm going to free the Silvenar. But it looks like I'll need to fight the Green Lady first. The Silvenar said he'd come help as soon as he can. The Green Lady's demeanor has changed! Only moments ago, we were trying to kill each other. Now, she looks as if she's awakened from some sort of trance. I need to talk to her. The wedding attendees have arrived. It seems Scout Anglith is here to deliver the Handfast. I should wait for her to pass it along. Scout Anglith delivered the Handfast, just in time. I should attend the wedding. Finishes quest The eldest of the spinners, Spinner Dothriel, officiated over the ceremony. I should speak with her. This page was last modified on 2 January 2019, at 04:41.